After running LoadedDllsView, the upper pane on the main window displays the list of all DLL files currently loaded on your system and when you select a DLL file in the upper pane, the lower pane displays the list of processes that loaded the selected DLL file. Filename:Name of the DLL file. 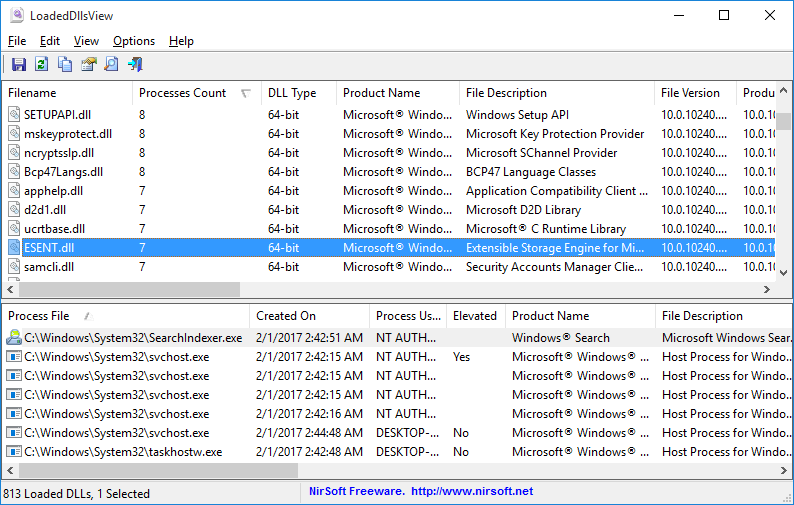 Processes Count:Total number of processes that loaded the specified DLL. DLL Type:Type of DLL - 32-bit or 64-bit. Product Name:'Product Name' value from the version resource of the DLL file. File Description:'File Description' value from the version resource of the DLL file. File Version:'File Version' value from the version resource of the DLL file. Product Version:'Product Version' value from the version resource of the DLL file. Company Name:'Company Name' value from the version resource of the DLL file. Internal Name:'Internal Name' value from the version resource of the DLL file. Copyright:'Copyright' value from the version resource of the DLL file. Original Filename:'Original Filename' value from the version resource of the DLL file. File Created Time:Creation time of the DLL file. File Modified Time:Modified time of the DLL file. Entry Modified Time:Entry modified time of the DLL file (Only on Windows Vista or later with NTFS file system). File Attributes:Attributes of the DLL file. File Size:Size of the DLL file. Full Path:Full path of the DLL file. Process File:Name of the process file. Created On:Date/Time that the process was created. Process User:The user that created the process. Product Name:'Product Name' value from the version resource of the process file. File Description:'File Description' value from the version resource of the process file. File Version:'File Version' value from the version resource of the process file. Product Version:'Product Version' value from the version resource of the process file. Company Name:'Company Name' value from the version resource of the process file. Internal Name:'Internal Name' value from the version resource of the process file. Copyright:'Copyright' value from the version resource of the process file. Original Filename:'Original Filename' value from the version resource of the process file. File Created Time:Creation time of the process file. File Modified Time:Modified time of the process file. File Attributes:Attributes of the process file. File Size:Size of the process file. Options -> Show 32-bit DLLs:If you turn off this option, LoadedDllsView will not display 32-bit DLLs. Options -> Show 64-bit DLLs:If you turn off this option, LoadedDllsView will not display 64-bit DLLs. Options -> Show Only Non-Microsoft DLLs:If you turn on this option, LoadedDllsView will only display DLL files that their company name is not Microsoft. View -> Use Quick Filter (Ctrl+Q): When you turn on the 'Use Quick Filter' option, a text-box is inserted below the toolbar. You can type a string or multiple strings (Depending on the search option you choose) in this text-box and then LoadedDllsView will instantly display only the DLL entries that contain the string you type. For example: If you type 'Intel' in the filter text-box, DLL files created by Intel (With 'Intel' in the company name) will be displayed. There is also an option to filter the DLL files by multiple wildcards, for exmaple: nt*.dll, msv*.dll ('Find filename by wildcards' option). /stext <Filename> Save the loaded DLL files list into a simple text file. /stab <Filename> Save the loaded DLL files list into a tab-delimited text file. /scomma <Filename> Save the loaded DLL files list into a comma-delimited text file (csv). /stabular <Filename> Save the loaded DLL files list into a tabular text file. /shtml <Filename> Save the loaded DLL files list into HTML file (Horizontal). /sverhtml <Filename> Save the loaded DLL files list into HTML file (Vertical). /sxml <Filename> Save the loaded DLL files list into XML file. /sort <column> This command-line option can be used with other save options for sorting by the desired column. The <column> parameter can specify the column index (0 for the first column, 1 for the second column, and so on) or the name of the column, like "Filename" and "Processes Count". You can specify the '~' prefix character (e.g: "~Processes Count") if you want to sort in descending order. You can put multiple /sort in the command-line if you want to sort by multiple columns. A file named LoadedDllsView_lng.ini will be created in the folder of LoadedDllsView utility. After you finish the translation, Run LoadedDllsView, and all translated strings will be loaded from the language file. If you want to run LoadedDllsView without the translation, simply rename the language file, or move it to another folder. This utility is released as freeware. You are allowed to freely distribute this utility via CD-ROM, DVD, USB Flash Drive, Internet, or in any other way, as long as you don't charge anything for this and you don't sell it or distribute it as a part of commercial product. If you distribute this utility, you must include all files in the distribution package, without any modification ! LoadedDllsView is also available in other languages. In order to change the language of LoadedDllsView, download the appropriate language zip file, extract the 'loadeddllsview_lng.ini', and put it in the same folder that you Installed LoadedDllsView utility.